On 1 December 2016, a Bill was published in the official Belgian Gazette implementing into Belgian tax law two amendments to the Parent-Subsidiary Directive. The first amendment to the Parent-Subsidiary Directive aims at tackling situations which would result in ‘double non-taxation’ by introducing a rule against hybrid instruments. Under this new rule, dividends received by the parent company will no longer be tax exempt whenever the distributed profit is tax deductible in the jurisdiction of the subsidiary (e.g. hybrid loans). The second amendment introduces a General Anti Abuse Rule (‘GAAR’). 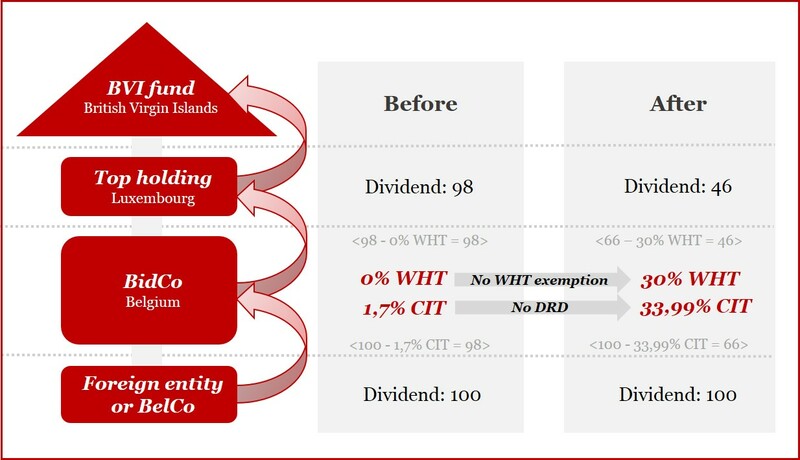 As a result, the Dividend Received Deduction (‘DRD’) and corresponding Withholding Tax (WHT) exemption will be denied whenever the dividends originate from legal acts or a whole of legal acts that are artificial (i.e. no valid business reasons that reflect economic reality) and merely in place to obtain the DRD and/or WHT exemption. After increased focus on beneficial ownership and substance, the tax authorities will now also take into account the economic rationale of transactions. Illustration: A BVI based fund (US institutional investor) investing in private equity transactions. The investment is structured with a Luxembourg based Top Holding and a Belgian BidCo. In the event HoldCo and Bidco would be set-up without sufficient economic substance, the new anti-abuse rule in the Parent-Subsidiary directive could result in a tax leakage of 54% instead of taxation of 1,7%. Previously this kind of artificially set-up structures could be challenged using the general Belgian anti-abuse rule (Art 344 §1 Belgian Income Tax Code). The introduction of the GAAR under the Parent-Subsidiary directive could result in an increased focus of the Belgian Tax Authorities to target this kind of structures. Note that both rules are not only applicable in a European context but also in a domestic context and in situations involving companies in third countries (i.e. countries outside the European Union). The amendments are applicable on income received/distributed as from 1 January 2016. For WHT, the amendments are applicable as from 1 January 2017. The measures amending the Parent-Subsidiary directive are a direct effect of the changing tax landscape. Further changes are already announced e.g. under ATAD. If you would like to discuss how these changes could affect your tax position, please do not hesitate to contact the undersigned.